to enrich the lives of people around the world with Alpha GEL. Joining hands with those around us, we work together to make our vision a reality. We believe in Alpha GEL’s endless potential. as we meet the new challenges each day brings. Breaking the mold, surpassing all limits. 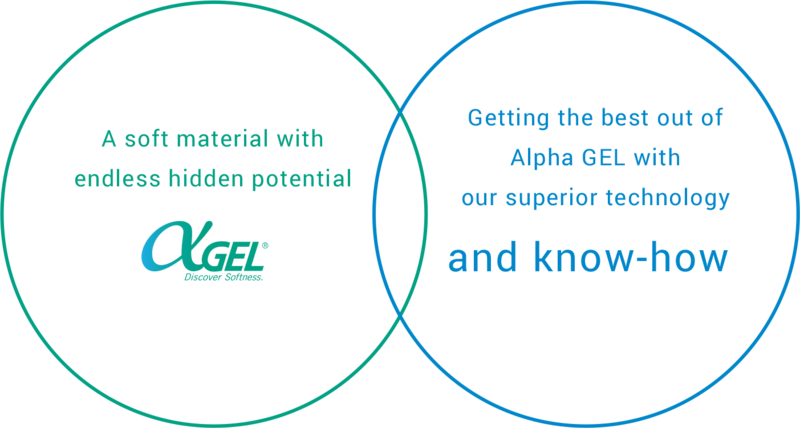 We believe that Alpha GEL is the key to a better, brighter future. Alpha GEL is a Taica original product made of soft silicone gel. Alpha GEL’s origin story began in the early 1980s, when one of our engineers fell sick while working on a project to develop a new shock absorbent material. When a melted gel ice pack accidentally hit him in the head, the softness of its impact gave him an idea: gels are great shock absorbers. He began analyzing the molecular makeup of every gel-based product he could find around him. Combining data from these tests, the engineer settled on silicone as the optimal material, and after some good old trial and error, he eventually was able to produce a marketable product. When a newspaper published an article about this remarkable material, onto which a raw egg can be dropped from a height of 18 meters without breaking, it caught the eye of major sporting goods manufacturer, Asics. This eventually led to joint development of a new shock absorbent material for sports shoes. In 1986, Alpha GEL was included in the Asics Freaks Alpha (Japanese domestic) and GT-II (international) sneaker models. 30 years later, Alpha GEL continues to be used in a variety of Asics shoes. Alpha GEL is not just for sneakers. Alpha GEL’s versatility shines in the fields of shock absorption, vibration isolation and damping, heat dissipation, optical bonding, and water/dust proofing. Alpha GEL is widely used in the automotive, industrial equipment, electronics, and care giving industries. Alpha GEL is also drawing attention as a unique material with untapped potential in new industries. Alpha GEL is used in cutting-edge fields such as AI, IoT, and even aerospace technology. The possibilities for Alpha GEL in new fields—from the micro to the macro—are endless. Exceptional softness and a unique molecular structure make Alpha GEL a highly effective shock absorber. Alpha GEL’s durability, safety, and thermal resistance (-40°C - 200°C) combined with Taica’s know-how and technical expertise allow us to offer the perfect shock absorption solution tailored to your needs. Alpha GEL’s exceptional vibration damping functionality, combined with highly soft physical properties, makes it far superior to conventional rubber dampers. Alpha GEL dampers can be used in both sensitive precision components and large-scale machinery for low to high frequency vibrations. Alpha GEL offers unique solutions for all of your vibration damping needs. By adding thermal conductivity to an extremely soft version Alpha GEL, we created Lambda GEL, a highly thermally conductive material able to dissipate heat while also efficiently eliminating gaps between surfaces. Lambda GEL is nonflammable and electrically nonconductive, making it a perfect choice for reducing loads on PCBs. We recommend Lambda GEL as a heat dissipation solution for a wide variety of applications. Silicone OCA (Optical Clear Adhesive) OPT Alpha GEL provides the long-lasting quality required in the automotive industry. This soft, yellowing resistant material allows for re-working of bonding defects and is available in a variety of thicknesses (max 1.8 mm). Taica proposes total optical bonding solutions to our customers, including advice regarding bonding and die cutting. Alpha GEL Cured-In-Place Gasket (CIPG) is realized with a combination of automated application directed by 3D plotting software and UV curing. We fine-tuned its viscosity and thixotropy to enable extremely precise application. This convenient water and dust proofing solution eliminates the need for molds, thus decreasing process time and reducing labor and other costs. is a trademark of Taica Corporation registered in Japan and/or other countries. Copyright © Taica Corporation, All Rights Reserved.